The weather in Denver was again hot and convective. I scheduled a usual VFR flight to become familiar with the area. During taxi I realized the Skyhawk had a lightning detector built in. After departure, my instructor asked me if I had seen the lightning ahead of us. 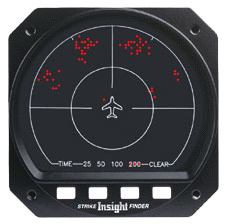 In fact, our “strike finder” indicated it accurately, about 40nm on 11 o’clock. Pretty cool. I didn’t think this instrument would be very useful, but flying in IMC with embedded thunderstorms around I fully understand its use now. It gives you at least some real-time information. In the training area I did a power on stall and a few steep turns. My instructor saw that I didn’t use the trim during the turns and he demonstrated a steep turn flown only by rudder and trim, without using the yoke at all. I should probably use the trim more often! Spontaneously we decided to do touch-and-goes at Rocky Mountain Metropolitan and Boulder airport. It was wonderful to enjoy the American airspace and rules. You can’t just land at an airport in Europe – you have to study visual approaches, individual patterns at each aerodrome and always park the airplane to pay your landing fees. Although the airspace in Denver is complex, with a lot of class bravo around, the controllers always try to fit you in. Therefore the instructions are complicated sometimes. During approach to Centennial the tower told me to remain west of I-25, south of Lincoln and report final for runway 35 right. My readbacks aren’t yet what they should be but I improved a lot. I will probably go flying a few times alone or with my girlfriend just to become more familiar with the American way to do things. I spent the afternoon studying at my flight school and I met someone who also needs to build time. She already holds her instrument rating and I could share flying time with her during my IR training. According to the federal aviation regulations it is possible to share time if there are two required crew members. That is the case if one pilot is wearing IFR training foggles and the other is looking out for traffic (note: time sharing is not possible under EASA). That way we can rent a Cessna for $60/h per person. That is about the same price as training in the schools Redbird simulator. Instrument ground school is going well too. The instructors share many stories and it makes it easier to understand rules and procedures. All the new information overwhelmed me in the beginning but now it begins to make sense. If you look at it in detail though, it becomes difficult again. My Cessna Flight Training course helps me to gain knowledge as well. This course actually brought me through my PPL without almost any other ground school. I really appreciate the work of Martha and John King. Their videos with this music from the 90ies (or 80ies?) are always amusing. During my time at Aspen Flying Club I also try to meet as many people as possible. Who knows, someone might have the network I need for my first job and I certainly need that if I try to find a job with as little as 350 hours. I already heard of some interesting options – but for now, I simply have to study.